Post frame construction is the ideal solution many types of municipal buildings, warehouses, retail outlets, and more. Also, post frame buildings are a great solution for agricultural, equestrian structures, and fire stations. This building method allows economic and environmental advantages. Post frame buildings offer wide open, uninterrupted space without interior columns or barriers. Therefore, the movement of people, animals, inventory, equipment, or vehicles is made easy. The load-bearing support for a modern post frame building is from substantial, widely spaced, treated wooden vertical columns around the outer walls. The roof structure consists of specifically designed and fitted trusses that are securely attached to the tops of the vertical columns. Consequently, this method allows the structure to withstand wind and weather conditions. As a result, a post frame building is energy efficient and durable. Post frame buildings also allow the free movement and storage of large vehicles, animals, and merchandise without obstruction or interference. Maneuvering within the building is simple and the line-of-sight is continuous. Schools and office buildings benefit from the flexibility of post-frame construction. Because of the open space and the elimination of load-bearing walls, configuring and reconfiguring interiors is easy. Thus accommodating change and growth. How Large Can a Frame Structure Building Be? Eventually, most building owners will lament that they should have built a bigger structure to accommodate growth and changing needs. A post frame construction can generally clear span up to 80’. The principal elements of post frame buildings are the specially treated vertical laminated posts. These posts are six or more feet apart and anchor at least four feet into the ground. The advantage of this type of construction is that high wind and weather forces are directed into the ground. Conventional “stick-frame” structures secure at ground level to a foundation or basement. Additionally, these are more vulnerable to shear forces in high force winds. In many instances, post frame structures survive catastrophic conditions while nearby conventional buildings suffer heavy damage. Post frame structures can be maximized to the sized building site. Driven by zoning requirements and the configuration of the lot, owners can build to yield the maximum square footage available with the flexibility of post-frame methods. And, as mentioned, additions are simpler given the wide spacing of the vertical columns. Experts in the field of post-frame materials production and construction, Pacemaker Post Frame Buildings is keeping pace with the rapidly growing demand for high-quality post frame buildings. Advantages like open and clear space, time-to-completion, efficient use of materials, expandability and adaptability, affordability, durability, energy savings, and sustainability are driving more companies, municipalities, and individuals to adopt this type of construction. If the size and flexibility of your new building are important, contact Pacemaker Post Frame Buildings to discuss ways that post-frame construction can benefit. Visit the Pacemaker Buildings gallery for examples of the many potential applications, large or small, of a post-frame building. If you have questions, visit the Contact section of our website. This entry was posted in Post Frame Buildings and tagged advantages of a post frame building, durability of post frame buildings, flexibility of post frame construction on December 18, 2018 by Jack Cripe. Many businesses, especially newer ones, are looking for the economical and appropriate space to conduct their operations. With business growth as a core objective, business managers continually review and assess the requirements for a successful expansion, hoping that they can move before their existing facilities interrupt operating efficiency. Whether your business requires individual office spaces, wide-open retail space, room for ample and easy-to-access storage, or a combination of these, post frame buildings can accommodate many configurations without having to work around load-bearing walls and other interferences. As your company grows, existing post frame buildings within can be reconfigured to adapt to changing conditions. Adding space is easier than with conventional structures because of the widely spaced vertical support columns. In high wind areas, building a structure that is proven to withstand severe wind damage and flying objects is essential. Specifically, in hurricane and tornado-prone areas, structures need to be built to last. The reputation of any business starts with the appearance of their facilities. A beautifully clad, designed and landscaped business facility or factory will create the best impression. Thus help to gain acceptance in the community. If expansion to accommodate growth requires a sizeable investment, further growth may be curtailed. A well-designed post frame building often minimizes interior load-bearing walls and pillars. The weight of the roof is borne by the sturdy pressure-treated vertical wooden perimeter columns. These columns are anchored at least four feet into the ground. This configuration leaves an unobstructed open area perfect for a variety of uses. From offices, retail shelving, production areas, and storage, to the ease of maneuvering for people and equipment. One of the most important features for a growing enterprise is the ability to shift partitions and equipment to accommodate higher volume and greater efficiency. Due to eight-foot or greater spacing between the vertical posts, makes it easy to add post frame additions. The widely spaced and deeply anchored wooden posts of a post frame building redirect wind load forces. Forcing them directly into the ground. Conventional construction is more likely to “shear off” at ground level where it attaches to a foundation during severe wind storms. After heavy storms, some post frame buildings have remained standing while other buildings in the area were leveled. A post frame building can have the same architectural features as overhangs, dormers, porticos, and more as standard-built structures. In addition, any exterior cladding like brick, wood paneling, stucco, wainscoting, and more is possible. Many people find that stylish post-frame-built home is an excellent option. Especially when panoramic vistas and open spaces are to be enjoyed. Post frame construction often requires less time to build, more efficient use of materials, and labor to assemble. The time from plan to finish for many post frame structures has been one-half the time spent for a conventional stick or metal frame buildings. Many of the components can are pre-built and fitted, thereby eliminating the waste that is of usually part of a normal construction project. Pacemaker Post Frame Buildings is the Midwest’s leader in post-frame construction. Strategically located in Northern Indiana, Pacemaker is a manufacturer, supplier, and builder of top-quality post frame buildings and components. Manufacturers and businesses should contact Pacemaker before making a final decision on any new facility. Post frame buildings meet all the criteria for any growing business, and Pacemaker can help you to make the right choices. Visit the Pacemaker Post Frame Building website gallery to view some of the remarkable and practical structures built for a wide range of applications. Also, on their website, Pacemaker offers their free downloadable Guide Book for planning a new building. If you have questions, visit the Contact Us page of the Pacemaker website with your contact information or phone 1-888-834-4448. This entry was posted in Post Frame Buildings and tagged advantages of a post frame building, durability of post frame buildings, flexibility of post frame construction, post frame building roofing options, post frame buildings on November 28, 2018 by Jack Cripe. Prospective barn and equestrian center owners have an extensive list of requirements to guarantee the structure matches their expectations. Especially to meet the requirements of functionality, cost, aesthetics, and durability. Coming up short in any of these areas can be regrettable and costly. 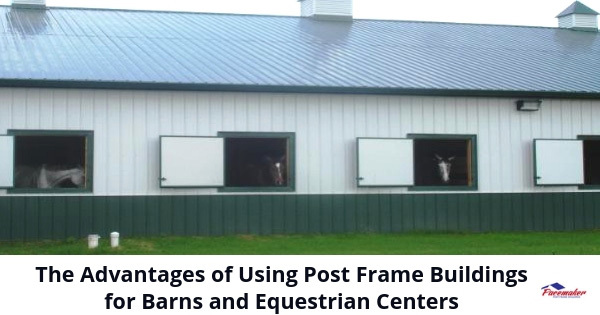 Post frame construction is the perfect option for barns and equestrian centers. Inherently adaptable, with wide, clear space within, post frame construction allows for unobstructed movement and notable flexibility. What is Post Frame Construction? An early form of post frame construction, pole barns, has been used for agricultural purposes for nearly a century. Over the decades, newer methods and materials have increased the viability of post frame construction for many other purposes. Today, civic buildings, schools, retail outlets, fire stations, schools, new barns, equestrian centers, schools, and even private residences use post frame technique. The building exteriors may be clad and finished with just about any material or architectural feature that may be used with standard construction methods. While post frame construction is relatively simple, the architectural engineering that produces a highly durable, versatile, sustainable, and practical structure is complex. Post frame buildings consist of widely spaced, pressure-treated heavy wooden columns anchored securely in the ground at depths of at least four feet. Secured to these vertical members are support girts and trusses that are connected without concrete, masonry or conventional wood or metal studs. As a result, external forces from high winds and even tornadoes are redirected through the vertical pillars and directly into the ground beneath. Barns and equestrian centers require open space to be effective. Obstructions like load-bearing vertical beams in conventional buildings present problems when maneuvering tractors, equipment, and horses within the structure. Backing up, turning around, and reversing is simple when these obstructions. Also, when storing supplies and feed for animals, loading and unloading are easier without the interference of space-limiting obstructions. As an owner’s needs change, interiors of any post frame building can be redesigned to accommodate more or fewer interior rooms or walls. No interior partition is load-bearing. Hence additional stalls and storage areas can be easily added to the building. If the original structure becomes too small for growing requirements, expansion is simpler than with conventional construction. Upright support beams are 8-10 feet apart in post frame structures. Thus a new addition may be added that immediately provides wide access from the original building. Post frame construction offers more for less. First, the design itself costs less due to its simplicity. Secondly, site prep only requires grading to level the surface. Also, the elapsed time from start to finish for a post frame building is roughly half of a conventional structure. Labor and material costs are substantially less. As well operating costs are lower. Eight foot spacing between vertical posts and deep cavities of the 4” support beams allow for more efficient insulation application. The standard 12 to 16-inch spacing with “stick frame” wooden framing creates many more “breaks” in the insulation. And therefore a greater opportunity for energy loss. Everything in a post frame building is recyclable. Furthermore, wood is a renewable resource. These elements, plus higher energy efficiency, make post frame building for agricultural and equestrian use a truly eco-friendly option. Pacemaker Post Frame Buildings, strategically headquartered in North Webster, Indiana, at the approximate center of the triangle created by metro Chicago, Indianapolis, and Detroit, is a leader in designing, manufacturing, and constructing post frame buildings for every application. Past and current projects include municipal and civic buildings, agricultural structures, residences, retail buildings, and more. To view some examples of Pacemaker’s outstanding projects, check out Our Gallery website section to see some amazing results in a range of categories. For more information about post frame construction, call the Pacemaker experts at 1-888-834-4448. Alternatively, complete the brief information section of the Contact Us page, and one of our Pacemaker professionals will contact you at your suggested time. This entry was posted in Post Frame Buildings and tagged advantages of a post frame building, affordability of post frame buildings, post frame barn, post frame buildings on November 14, 2018 by Jack Cripe.